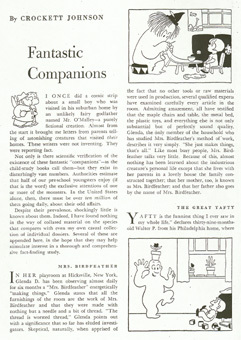 "Fantastic Companions" appeared in the June 1955 issue of Harper's Magazine, and recounted the stories of six "fantastic companions." Apparently, reading about Mr. O'Malley prompted many parents to write with tales of their children's unseen friends ("unseen" only by the parents, of course). Its tone is gently satiric, but its target is more psychological studies of childrens' "fantastic companions" and not so much the children themselves. All of Johnson's illustrations are quite charming, but my favorite is "Bears with Wots on Them" (reprinted below). 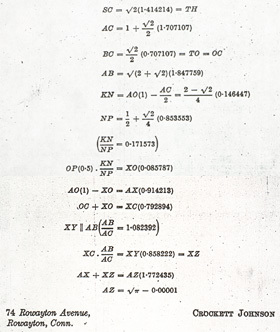 This article appears in The Mathematical Gazette: The Journal of the Mathematical Association of February 1970. 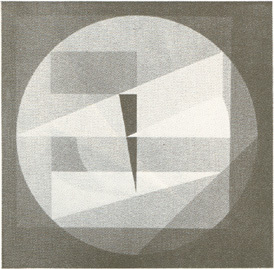 This essay, first published in Leonardo 5 (1972) and reprinted in Frank J. Malina's Visual Art, Mathematics and Computing (1979), explains the ideas behind Johnson's paintings. 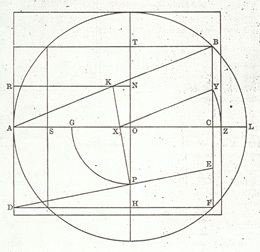 The square root of Pi (represented both in the theorem above and in the drawing and painting below), as Johnson points out, "is a transcendental number and certainly it cannot be arrived at by means of a compass and a straightedge. [...] However, the painting is conceived as a construction 'moving' back and forth between close plus and minus limits across the point describing the solution" (98). Johnson writes, "algebra [...] tends to make me lose a graphic grasp of a picture. Instead, as I did in approaching the problem of the squared circle, I played with what I knew in advance to be the elements of the problem, imagining them as a construction in motion, an animated film sequence with an infinite number of frames running back and forth between plus and minus limits acroos the point of solution" (99). For Johnson, then, geometry is a form of animation -- his geometric paintings turn algebraic hypotheses into motion pictures. To illustrate this point, the article includes black-and-white photos of six of Johnson's paintings, the theorems behind two of them, and a color photograph of one. Construction for the Squared Circle painting shown at right. 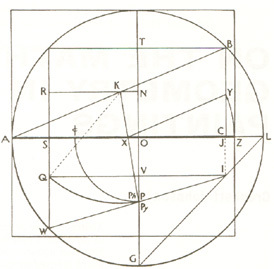 Both this and the painting are from Visual Art, Mathematics and Computers (Pergamon Press, 1979), edited by Frank J. Malina, p. 144. Oil on pressed wood, 48 x 48 in. Photo by J. Curtis, Norwalk, CT. 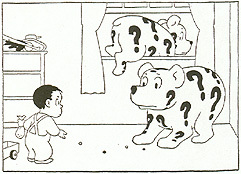 The photograph is in black-and-white, but the painting is in color. To see a color photo, click here.